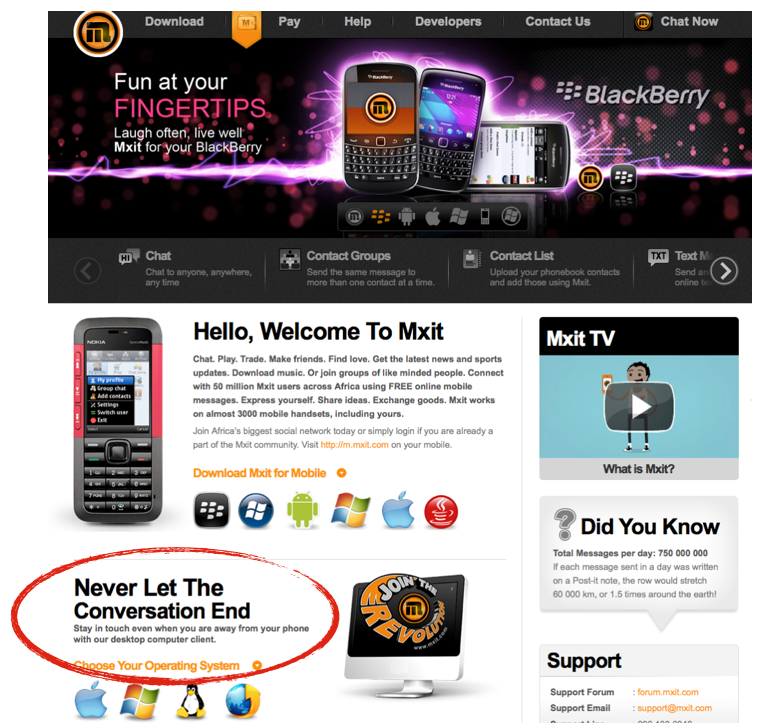 Was doing some research for a story I am writing over at TechPresident which had me visiting the site of Mxit, a social network built largely for mobile phones and used by urban youths in South Africa. It’s not that we’ve needed more evidence for understanding that the way access to the internet was going to come to emerging economies was not through one laptop per child or telecentres but via cellphones. That all said, it is still very striking when you see a manifestation of that logical conclusion spread out right in front of you. Today there are over 500 million cell phones in Africa and, according to the Guardian, that number is growing fast. As the percentage of smart phones increases as well, I’ll expect more of these moments that seem foreign to me, someone who started out on the non-mobile internet. This entry was posted in cool links, technology on July 5, 2012 by David Eaves.